I have never brined a turkey before but I wanted to give it a try. I had tons of cider around and wanted to do something special. The result was amazing and the turkey was super juicy. 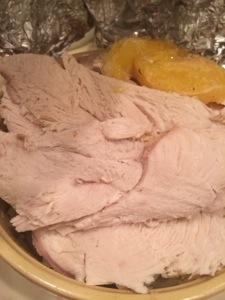 The most important part of the method is to start the process 24 hours before you plan to start cook the turkey. First, add water, cider to a large pot and start to head. Add remaining ingredients to pot. Stir and heat until bubble start to form. Make sure all the sugar and salt have dissolved and shut of heat. Allow mixture to cool fully, at least 4 hours. Later, add cleaned and rinsed turkey to the solution. Make sure the turkey is fully submerged in the liquid, if it starts to float try placing a bag filled with ice on top. Place the whole thing in the fridge and allow it to chill from 8-12 hours (no longer). Once your ready to roast remove from liquid. Rinse the turkey very well to get ride of any extra salt. Prepare as you normally would and roast. Enjoy!